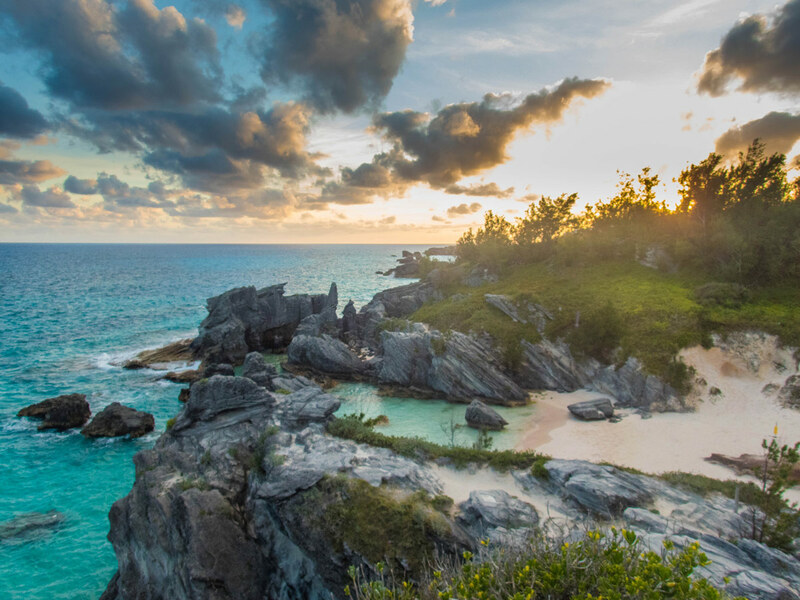 The North Atlantic island of Bermuda is known for emerald waters and its deep Pirate history. But this small country also has some of the most beautiful coastlines we have ever seen. 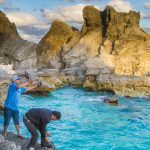 We visited just before the high season, when the temperature was balmy by our standards, in search of the best Bermuda beach. 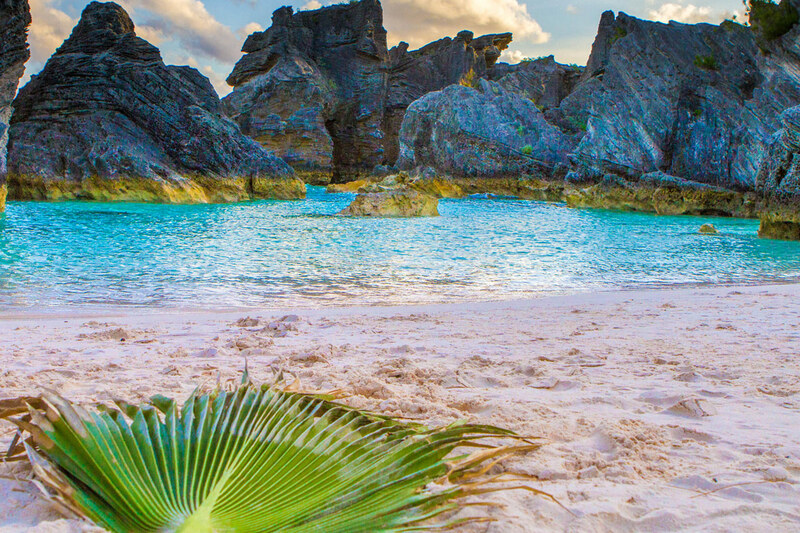 One of the most incredible beaches we discovered is the famous Horseshoe Bay Beach in Bermuda. 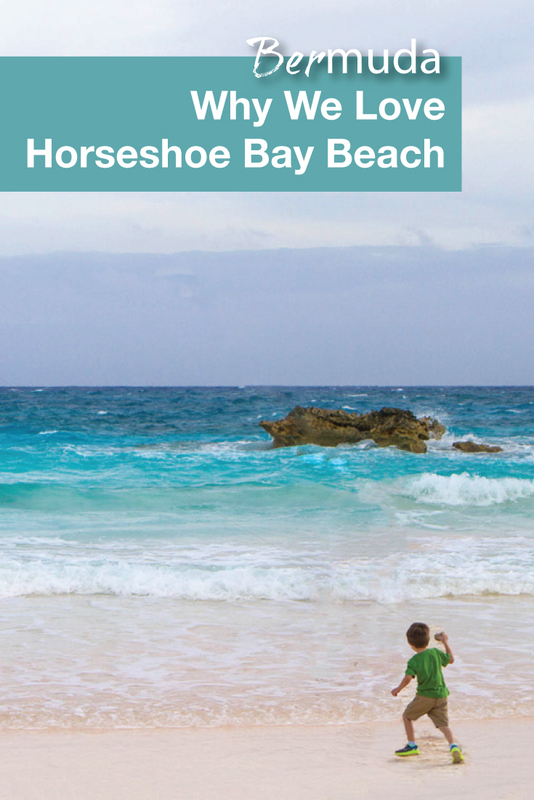 Why did we love Horseshoe Bay Beach? Horseshoe Bay Beach is situated about midway between St. Georges and the Dockyards. It’s located in the Southampton Parish right down the hill from the beautiful Fairmont Southampton. It was rated by Conde Nast Traveler as one of the top 20 beaches in the World! And it’s easy to see why. 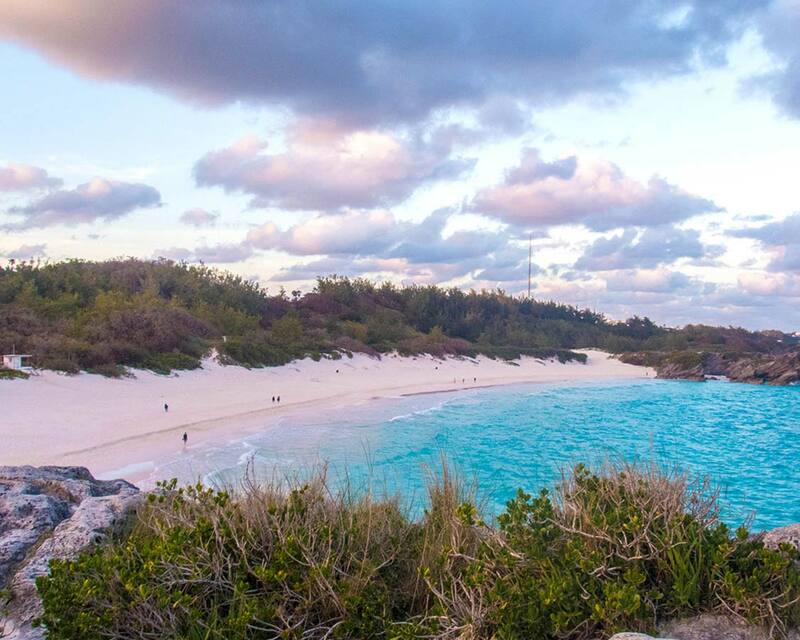 Horseshoe Bay Beach in Bermuda is famous for its pillow-soft, pink sand. Yes, that’s right. Pink! This is due to tiny, red organisms that grow under coral reefs and are then washed up on shore. These little bits of coral and shell mix with the sand and give the beach a pink hue. How cool is that?! It’s like 2 beaches in 1! Horseshoe Bay Beach in Bermuda has a second area called Port Royal Cove. This spot, which we actually loved even more than the main beach, is separated from Horseshoe Bay Beach by a small rock outcropping. Port Royal Cove has calm, shallow water that is perfect for kids, and the surrounding rocks are just stunning to behold. Our boys loved chasing the Parrot and Angel fish that love to hang out in this spot. We visited Bermuda during the Easter long-weekend. Each year on Good Friday, Bermuda features an incredible kite-festival. 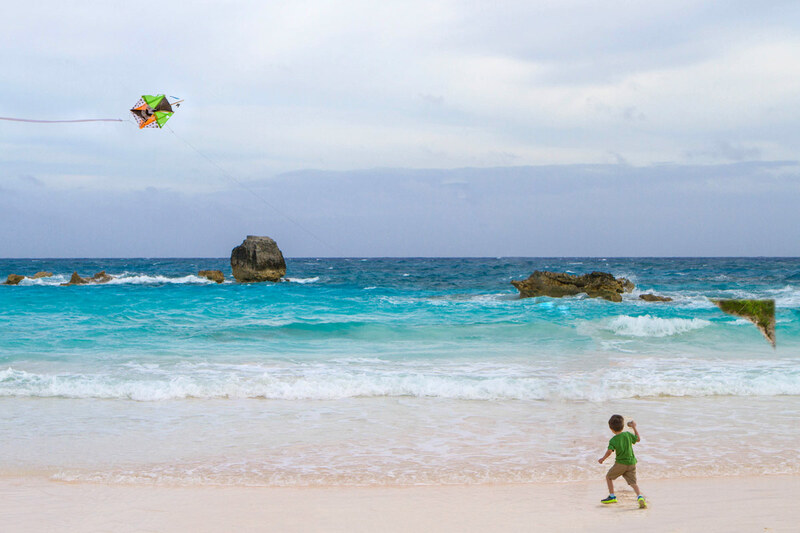 During this festival, thousands take to the skies around Bermuda to show off their kite-flying expertise. C even built his own kite for the festival and brought it down to Horseshoe Bay Beach to take part. In August, Horseshoe Bay Beach in Bermuda also hosts a Sand Sculpture competition. Competitors from around the World meet to dig their best displays into a 12×12 ft space. 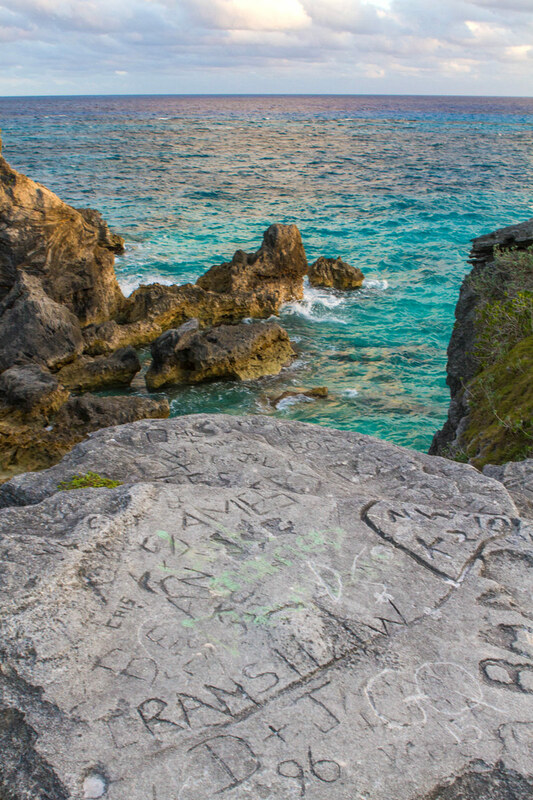 Lying between Horseshoe Bay Beach in Bermuda and Port Royal Cove is a rocky hill that is perfect for exploring. The ascent is steep, but the views from the top are fantastic. We were lucky on our climb and came across a number of local fishermen pulling in their catch of the day. 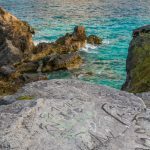 At the top of the path closest to Port Royal Cove is a rock covered in carvings of the names of explorers who have made their way to the top. Bermuda is not exactly difficult to navigate. There is a single highway that runs the length of the island. You can get almost anywhere in an hour. Horseshoe Bay Beach in Bermuda lies along the main highway between St. Georges and the Dockyards. From Hamilton, you can take the #7 Bus. This takes about 35 minutes (Bus fare is $5.00 by cash.). You can reach Horseshoe Bay Beach in Bermuda by taxi. From the King’s Wharf cruise ship pier at the Royal Navy Dockyard, a taxi runs about $30 and takes about half an hour. Shuttles run regularly between the Dockyards and Horseshoe Bay Beach in Bermuda during the high season. The prices vary between $8-$12 per person for a one-way journey. Being one of the most popular beaches on the island, it can get busy during peak season; if Horseshoe Bay Beach Bermuda is too busy for your liking, you can always walk along the trail further east to reach other popular beaches like Jobson’s Cove and Warwick Long Bay, which is great for snorkeling. Like any great beach outing, a picnic is a great way to save your spot in the sand. But, if getting sand in your food isn’t your idea of fun, there are some restaurants nearby to fill your belly. Located between the parking lot and the beach in a little blue building is the Horseshoe Bay Beach Cafe. This spot features washrooms and beach rentals, as well as decent beach food like burgers, hot dogs, soda and beer. Situated a short walk from Horseshoe Bay Beach is a private beach for those staying at the Fairmont Southampton. This pretty beach offers some rocky shoals and features the Ocean Club and the Rum Bum Beach Bar. While it says that this area is only for those staying at the Fairmont Southampton, we didn’t see anyone checking ID. 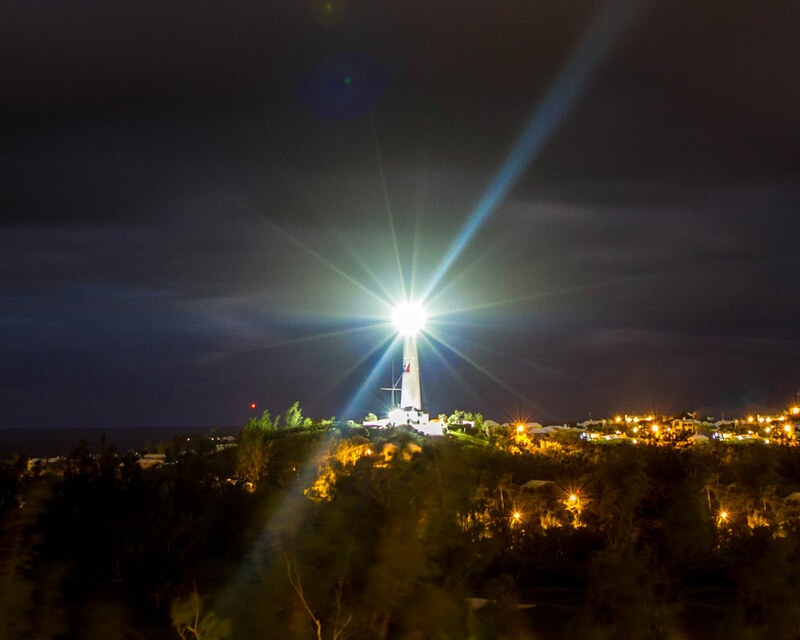 If you don’t mind sacrificing a little time and some cab fare, nearby Gibb’s Lighthouse offers highly regarded food and amazing views of both sides of the island. Is Horseshoe Bay Beach worth the visit? 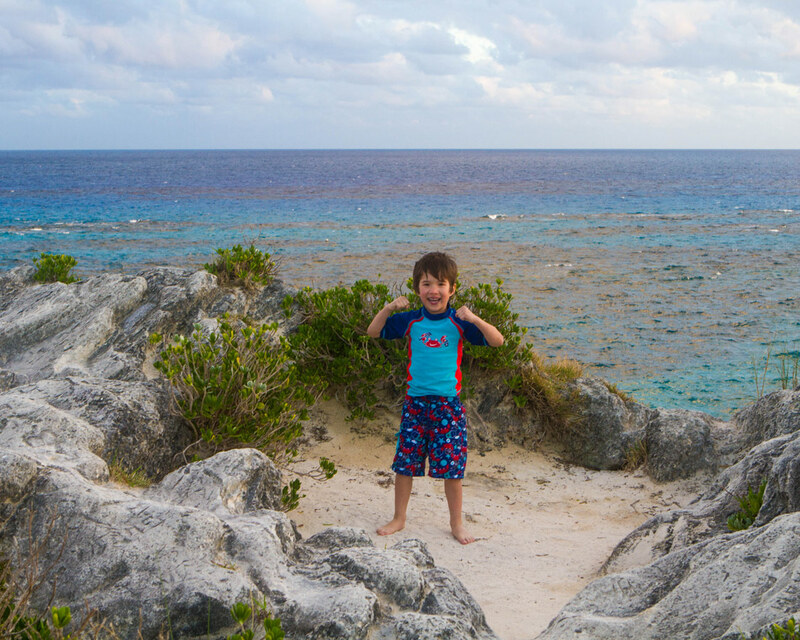 If we had a choice between boating in Bermuda or visiting Horseshoe Bay Beach, there is no question about which one our kids would pick! 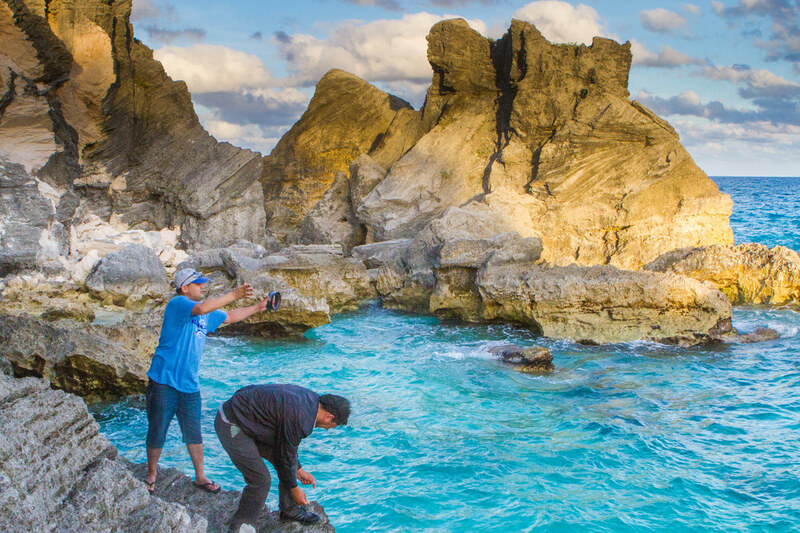 No visit to Bermuda is complete without stopping to see the amazing sand, and taking a splash in the amazing waters. If you have the time, spend the day and treat yourself to every inch of this incredible place. What’s not to love?! With pink sand, and a secluded cove…a place where the kids can climb and explore, and those incredible views?! Horseshoe Bay sounds amazing! You’re lucky to have been able to visit! Isn’t pink sand incredible? Contrasted with the teal blue sea, your photos are like a wonderland of pastels. Your photo of Port Royal Cove makes me wonder how you managed to tear yourself away to go back home! My golly~ this beach looks amazing! I have not been to Bermuda but this is definitely my kind of beach. Pink sand and seclusion wins in my book, every single time! Pink beach..white waves.blue water..and the rustic mountains beyond. What a painting by nature! It livened up the painter inside me. Would definitely love to visit here. Thanks so much! It’s so far from the Caribbean that it often gets overlooked! You had me at pink sand! :O wow what a beautiful place. I’ll remember these photos in case I ever get a chance to visit this area. What lovely crystal clear turquoise waters. The pictures look stunning. Would love to fly a kite, just like C, I am sure he had a thrilling time. Gibbs lighthouse looks inviting too. Your pictures are epic and totally awe inspiring. Not only are the pics of the beach amazing, but even that shot of the lighthouse. 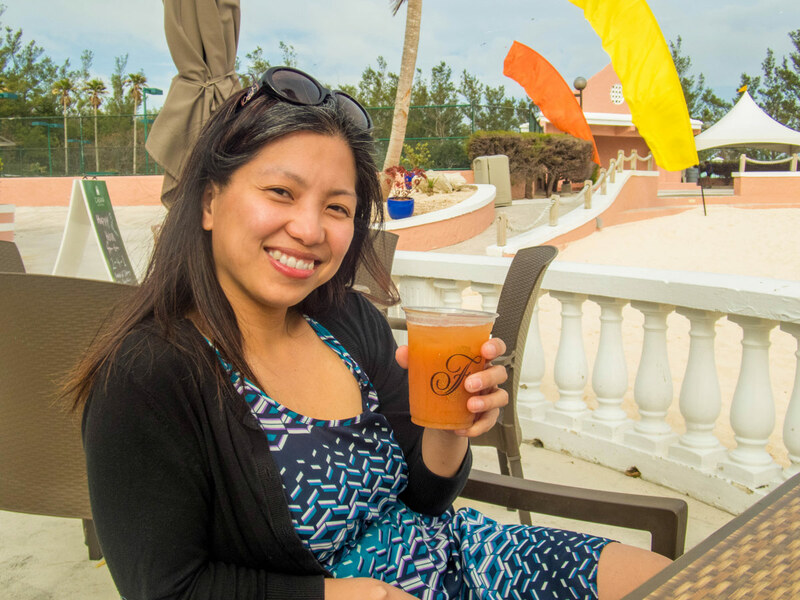 And who wouldn’t love to chill at the Rum Bum Beach Bar? That looks just stunning – I love the idea of pink sand too. Have seen black and purplish beaches but pink is still on my list. I love it! Finding a great beach is surprisingly hard to find. I would love to visit Pink sand! 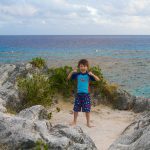 I’ve never thought of traveling with the kids to Bermuda but after seeing these gorgeous pics of the pink sand beach I almost feel obligated to do so. Horseshoe Bay has so much to love. Your photos make it look irresistible. We’d love to catch the kite festival next Easter. Great tip. I’ve never really considered Bermuda as a holiday destination before but your photos make it very appealing! Those Caribbean waters really pop with blue! Your description sounds so much like the pink beach of Indonesia. Except that I think the sand here is much softer. Lovely pictures ad usual.